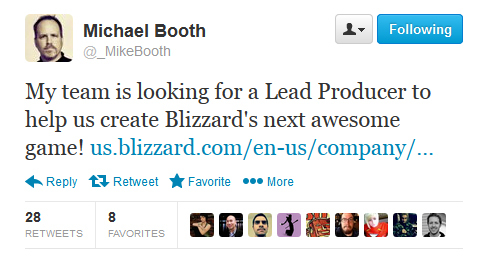 Blizzard Entertainment is looking for a Lead Producer for a yet to be announced video game. The job opening description mentions this game is in development by a small team like that of Hearthstone. On Twitter, Mike Booth posted he is looking for a Lead Producer for his team. I am not certain yet if this is not the same position, but it might be. Mike Booth joined Blizzard Entertainment on May 2013 as game director of this small team. It is really hard to figure out what type of game a game developer with his calibre is working on based on his past work. He could be working on a different genre. With Dustin Browder, when I first heard he worked at Blizzard, I looked at his past work and speculated he was working on StarCraft II. Some time later, StarCraft II was announced. Michael Booth hails from Turtle Rock Studios as CEO — and if that studio doesn’t ring a bell to you, let me hit the gong hard for you. Turtle Rock Studios worked with Valve in the Counter-Strike series and Left 4 Dead. Michael Booth shares credit as one of the four Counter-Strike programmers, and he was the Project Lead for Left 4 Dead. I ain’t saying this particular unannounced Blizzard game will have zombies, nor that this is a First-Person Shooter… but I really wish it was if this guy is on the steering wheel. Now if that didn’t get you excited, then I shouldn’t mention what genre StarCraft: Ghost is. Pew pew pew! The same small team is looking for a 3D Weapons Artist and the description for the job requests that the candidate should have experience working with a diverse range of equipment, vehicles, and mechanical characters. What’s Blizzard cooking? When will we hear about it? Those are fair questions for which we might not have an answer in quite some time. In the meantime, spread the word. If you got the talent or know a family or friend with the talent or a friend of a friend … let them know this job opening is available. Blizzard’s newest game team is looking for someone to join its ranks as lead producer. With Hearthstone, Blizzard has revived its tradition of creating small and nimble game teams and we are following in those footsteps. As part of our team, you will join in the leadership of a small but mighty band of developers and exert your talents to help craft our processes, organization, goals and execution. We can’t tell you exactly what the game is yet, but trust us, it’s awesome. Ideally, you have passion for and experience in wrangling both small scrappy teams and large multi-discipline juggernauts. You enjoy getting your hands dirty in day-to-day game production as well as thinking strategically in solving high level challenges. Maybe you even enjoy personally jumping into databases or modeling packages from time to time. You speak the languages of art, engineering, game design and business – some fluently, the others enough to be dangerous effective. In short, you understand the science and appreciate the art of making amazing games, and have made it all come together in the shipping of world-class products. Project manages all aspects of the game. Provide leadership, guidance and execution to ensure both quality and timeliness of objectives and milestones. Champion the game to all external departments to build transparency, knowledge and passion for the project. Communicate with executive leadership on status, risks, and needs of the project. Do whatever it takes for the game to be great, the team to be healthy, and the execution to be flawless. Blizzplanet journalist and network manager Eldorian interviewed author Nate Kenyon by phone to dig more into the storyline of StarCraft: Ghost–Spectres , a novel many fans of the StarCraft Universe have been anxiously awaiting for almost three years and a half (title revelation: May 10, 2008). The StarCraft: Ghost–Spectres was originally assigned to be written by Keith R.A. DeCandido. For reasons only the Asgardian Norns might know, the direction of the book landed on the good hands of Nate Kenyon, a Bram Stoker Award finalist for both Bloodstone and The Reach . Nate Kenyon’s most recent novels (The Bone Factory and Sparrow Rock ) have received great recognition by the American Library Association’s Booklist Magazine and Publishers Weekly. 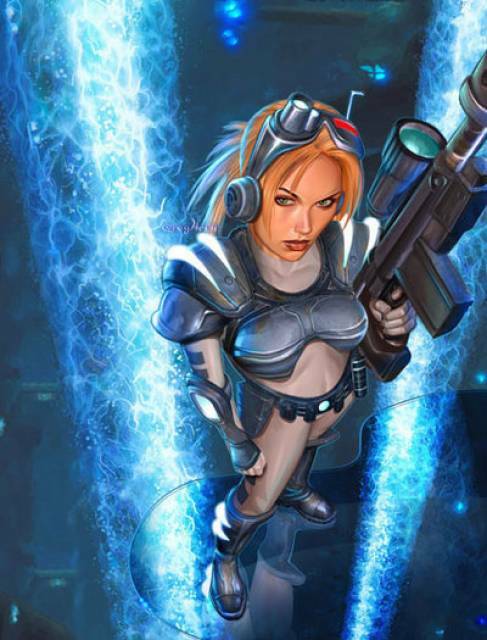 Listen to the phone interview, and don’t forget to order StarCraft: Ghost–Spectres . StarCraft: Ghost–Spectres by Nate Kenyon is now available in Mass Market Paperback and eBook formats. Order it here . StarCraft: Ghost–Spectres is the novelization of the postponed 2006 first-person shooter video game. I was given a review copy last week. Expect a short article in upcoming days. So far so good. Eldorian is holding a live phone interview with the author, Nate Kenyon, any time in the next couple of days with questions forwarded by me — so feel free to submit a question to cram it in before the interview. The Dominion Ghost Program wipes the Ghosts’ memories often after each mission, and their implants make them obey orders as mindless slave drones. In this novel, Nova’s past will come crashing down on her as she slowly regains her traumatic childhood and ghost academy memories. If you have read StarCraft: Ghost Academy Vol. 1-4 (Tokyopop) and StarCraft: Ghost — Nova are up for a treat with all the continuity elements and characters from Nova’s past coming back to haunt or help her in this new Terrazine-centered mission. Here’s a preliminary and incomplete view of some locations, characters, organizations mentioned in the novel. A more detailed list will be provided when the review is ready. What terror can haunt a ghost? Nova, an elite stealth operative with exceptional telepathic and telekinetic powers, embarks on a heart-stopping mission that pits her against her own kind and forces her to confront her tragic hidden past. Ghosts epitomize the height of terran evolution and physical conditioning. Born with incredible psionic potential, these individuals are recruited and quarantined for government training from childhood. Like most ghosts, Nova Terra had all memories of her prior life buried when she became a member of this elite corps of covert operatives. Unlike most however, Nova actually wanted to erase her personal history and put all of her painful memories to rest. Now, one of the most powerful ghosts in the Terran Dominion is about to be haunted by her former life when a forgotten friend joins her mission to located missing members of the ghost program. The shocking secrets they discover will pit Nova against both the shadows of her past and the future of terran psionic warriors: spectres. StarCraft: Ghost — Spectres explodes from the universe of StarCraft II, the eagerly anticipated sequel to Blizzard Entertainment’s top-selling science-fiction real-time strategy game. Enter Nova Terra, a ghost of unparalleled ability. On orders from Emperor Arcturus Mengsk, Nova embarks on a secret mission to find her missing comrades. As her investigation leads down a maze of dark corridors, painful memories of her pre-ghost years begin to surface. Soon, Nova learns that there might be a connection between the missing agents and her past, a discovery that will pit her against both the shadows of her youth and a terrifying new breed of psionic warrior: spectres. Blizzard Entertainment and Pocket Star Books will launch StarCraft: Ghost–Spectres on Tuesday, September 27, 2011. This new StarCraft novel introduces the background story of Spectre Ghost Gabriel Tosh. It seems some of the characters found in the StarCraft: Ghost Academy (Tokyopop) will make cameos — including Nova and Kath Toom. Chris Metzen said at San Diego Comic Con that StarCraft: Ghost Spectres is the novelization of StarCraft: Ghost (the postponed game). It’s definitely a must-have for those who hungered for the game. Now — this is my opinion: Think of it as the Warcraft: Lord of the Clans of Warcraft Adventures — except Ghost was postponed, not cancelled. One day we might see StarCraft: Ghost the game. Most likely with a different storyline, more up-to-date with StarCraft II’s episodes. Blizzplanet was scheduled to interview its author Nate Kenyon next week. We would like our visitors to submit questions about this novel after reading the two teasers below. You can submit your question by posting at the comments section (bottom), at our Facebook or via email. Eldorian will be on the phone with Nate Kenyon forwarding your questions. We’ll embed the interview soon so our visitors may listen to it. Order your copy of StarCraft: Ghost–Spectres (mass market paperback, Kindle, or Kindle PC available). Activision Blizzard announced recently to its shareholders and media, including me, they would broadcast their announcements at the 2011 Citi Technology Conference on September 8, 2011 at 10:45 AM (ET). Speakers: Thomas Tippl (COO, Activision Blizzard) and Rob Pardo (Blizzard EVP of Game Design). According to Thomas Tippl, Blizzard Entertainment will release SIX video games based on known intellectual properties (IP) in the upcoming three years. That doesn’t count the upcoming Next-Gen MMO which is based on a brand-new IP. 6. Whoa? … again … WHOA? As you see from the pipeline above, there is a sixth game unaccounted for here. Thomas Tippl mentioned six games based on known IPs within the next three years. The World of Warcraft has been shipping expansions within 21-25 months (nigh two years). The next WoW expansion will be announced at BlizzCon 2011, and might ship around Q4 2012 – Q1 2013 (as a wild and highly inaccurate guess). Thomas Tippl’s projections span from 2012 – 2014 … Can Blizzard cram in two expansions in a lapse of three years? On the other hand, StarCraft II is known to have three episodes, of which Wings of Liberty was shipped on July 27, 2010. “Heart of the Swarm” is coming out on 2012. That falls into the standard 21-24 months development cycle. This gives “Legacy of the Void” room to ship around 2014, and thus why I listed it above within Thomas Tipple’s three years projection. On the Diablo III front, Jay Wilson mentioned in an interview last year plans for “expansions”. Mike Morhaime and Rob Pardo have mentioned hopes to ship Diablo III by Q4 2011, but they won’t sacrifice quality to push a 2011 release date. Let’s pretend Diablo III ships on 2012. Based on a 21-24 months development cycle, Blizzard can cram in a Diablo III expansion in this “three years projection”. A third Diablo III expansion? Maybe. Maybe not. As seen, it’s hard to tell what this mysterious Sixth known video game IP fits in Thomas Tippl’s announcement today at the 2011 Citi Technology Conference. Take in mind, Thomas Tippl said known IPs. The Next-Gen MMO doesn’t count. That’s a brand-new IP, not an existing one. Take your best guess shot. Another possibility is that Blizzard might develop a mobile game (iPad, Sony NGP) — but that’s further down in the speculation spectrum. You can listen to the 2011 Citi Technology Conference broadcast here. Gamespot article titled “Activision Blizzard COO Thomas Tippl says publisher expects six releases from studio, including Diablo III and one expansion”. The updated front cover for the StarCraft: Ghost Spectres novel by Nate Kenyon is now available. The 336-pages novel will be available in the following formats: Mass Market Paperback and Kindle. It ships on September 27, 2011. You can pre-order StarCraft: Ghost–Spectres (Starcraft (Unnumbered)) now. The ghost spectre known by StarCraft II: Wings of Liberty players as Gabriel Tosh debuted in the pages of StarCraft: Ghost Academy by Keith R.A. DeCandido (publisher: TOKOPOP) as a ghost student in the same team with Nova Terra. Find out how Gabriel Tosh grew from a Mengsk idealist into a rebel against the very figure he idealized. Note: Hold down the right-button and choose “Open Link in New Tab” to view the 800px version front cover. The pre-order of the Kindle version of the StarCraft: Ghost–Spectres novel by Nate Kenyon is now available. Pre-order now and the novel will be auto-delivered to your Kindle or other device on September 27, 2011. The mass market version pre-order is also available. If you don’t have a Kindle device, the Kindle App allows you to read books in your PC, Mac, iPad, iPhone, BlackBerry, Android and Windows Phone 7. Following on the heels of the release of StarCraft II —the sequel to Blizzard Entertainment’s groundbreaking strategy game—Nova, an elite stealth operative with telepathic and telekinetic powers who embarks on a heart-stopping mission that pits her against her own kind and her tragic, hidden past.